I’m easing myself into this project of mine. So far, I haven’t gone out of my way to seek out treasures – they’ve just been on my route, but of course, it’s early days. As I left work today I decided on a whim to park up the bike outside St. Patrick’s Cathedral, having spent the past six months cycling past it twice a day and vowing that one day I’d actually go inside. So began Date #2 of Dates with Dublin. Pretty, isn’t it? I should warn you right now; my photography skills are non-existent. A left-handed blind goat would probably do better with a point-and-click. I really wish I had more of an eye for photos, or even the slightest idea of how to work my camera. Either one of those would be helpful, but you get the picture anyway (ho ho). 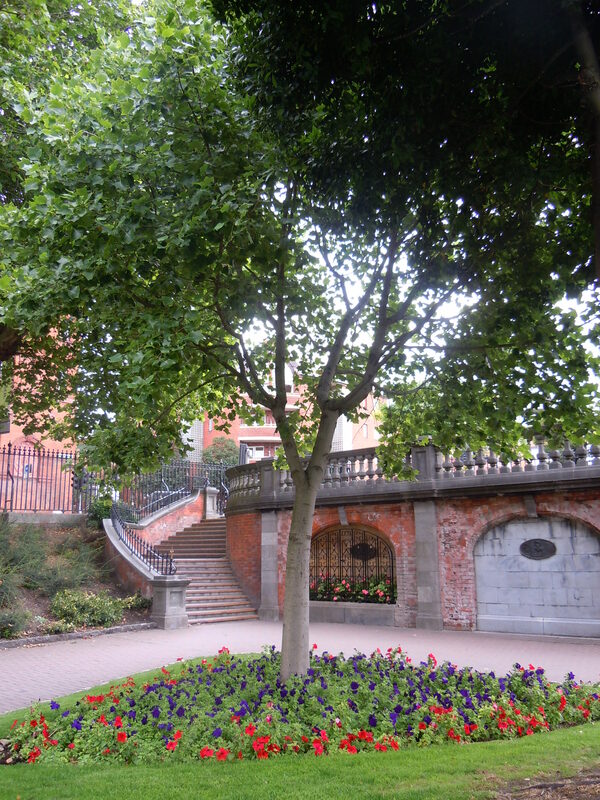 The park is a little oasis of calm off the busy thoroughfare of Patrick Street, and, hidden at the back, there’s a homage to Dublin’s many esteemed authors on the Literary Parade. Inside I ventured, to be greeted by two lovely ladies at the desk. Admission is typically €5.50. “Where are you from?” they asked. “Mayo”, said I, and they waved me on in. “It’s a national Cathedral, so it’s yours to visit as you please”, they said. Evern Mayo, eh? Who knew. So far, so nice. I put my money back in my pocket and plodded on in. Inside, it looks like … well, a typical Cathedral really. The building dates from 1191, so is over 800 years old. There are more monuments and plaques inside than you can shake a stick or camera at, so I busied myself wandering around to see if I recognised anyone from my days of Junior Cert history. My memory’s not very good. I spotted St Patrick (oddly enough), Douglas Hyde and Jonathan Swift, and after that, your guess was as good as mine. There are some highlights. Firstly, the building itself is really impressive – tall, imposing, elegant. The stained glass windows, while relatively new, dating from the 1800s, are stunning, and while the cathedral is busy with the hum of tourists, it’s a relaxed and welcoming space; almost informal. If you’re looking for solemnity and hushed tones, you won’t find it here, but I don’t think that’s a bad thing. While I’m all for a bit of a history, what intrigues me the most is people and what they got up to back in the day. I wasn’t disappointed with some of the stories from St. Patrick’s. It’s probably best known for its most famous Dean, author Jonathan Swift, who, despite yearning for a post in England was greatly admired for the passion with which he fought what he felt were unjust impositions on the Irish people. The man himself is buried within the cathedral, alongside his lifelong friend and companion, Stella. Swift met Stella through a former employer when he was a young man and she was just eight years old, and the two remained close until her death in her mid 40s, though despite much speculation, nobody knows the exact nature of their relationship . And so the mystery and ambiguity remain t this day, and whether or not they ever wed remains the subject of debate. 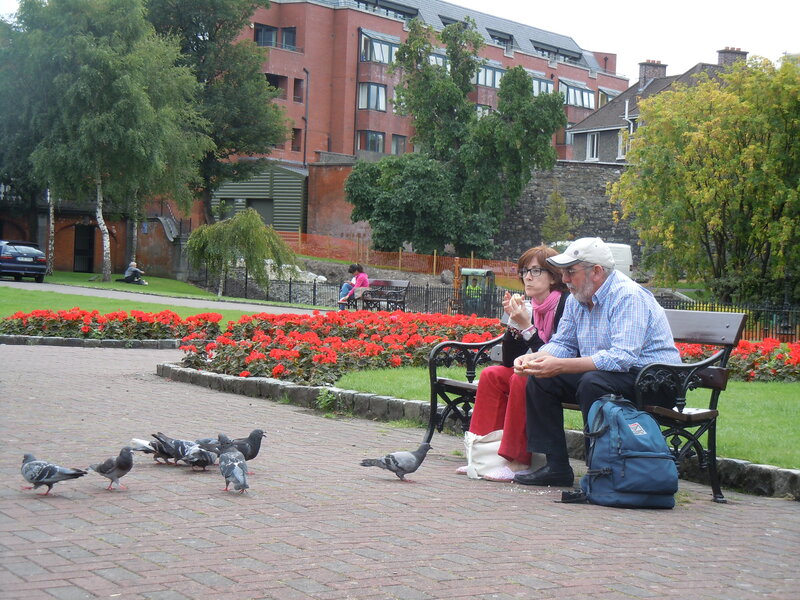 Their secrets remain forever between them in what must be one of Dublin’s more intriguing love stories. Mooching around in the glass cases close to the graves, I discovered a cast made of Swift’s skull. Relishing the macabre as I do, I was intrigued to read that the skulls of Jonathan and Stella had been exhumed some 90 years after their death, so that they could be examined by a team of phrenologists. Phrenology, now long discredited, was a rather fashionable science in the 1830s, and consisted of examining the shape of human skulls to reveal character traits and intelligence levels. If nothing else, it allowed us to see what shape Jonathan Swift’s head was. The inside of Swift’s head was another matter; in his later years he was troubled with dizziness and noises in his ears, and this, combined with a stroke he suffered led many to dismiss him as mad before his death. It was only during his exhumation that the physician Dr. William Wilde (father of that literary rascal, Oscar) went poking around and discovered that Swift had been suffering with a loose bone in his inner ear, and that Meniére’s Disease, not madness, was at the root of his problems. This in itself was ironic, given that Swift had left a substantial sum of money to St. Patrick’s Hospital for the Mentally Ill; which is today still in operation. There’s lots more information on this incident over at Come Here To Me! which is well worth a read. Another story I liked was that of the origin of the phrase “Chancing Your Arm”. In the late 15th century, two famous Irish families, the Butlers of Ormonde and the FitzGeralds of Kildare, had a bit of a falling out about a high-paying job – Ireland hasn’t changed that much – and the situation escalated into some a kerfuffle and some waving of handbags outside the Dublin city walls. (I may be exercising some artistic licence here.) The Butlers fled and hid out in the Cathedral, with the Fitzgeralds in hot angry pursuit. However, the calming atmosphere of the place clearly had an effect on the latter, and upon arrival, they knocked on the door of the Chapter house where the Butlers were holed up, and asked that the two families make peace. The Butlers were terrified, and assuming it was a trap, refused to exit lest they be butchered on the spot. Gerald Fitzgerald, (with, one would suspect, rapidly evaporating patience), ordered that a hole be cut in the door, and thrust his arm through to offer his hand in peace to the Butlers. The Butlers, realising that Fitzgerald was willing to “chance his arm”, relented and shook hands (with, one would suspect, no small degree of embarrassment) and the two clans kissed and made up. The “Door of Reconciliation” is still on display in the Cathedral. There’s lots more to see in the Cathedral, including the beautiful carved stone staircase, the gorgeous Ladies Chapel and the rather bamboozling looking organ which, I believe is one of the largest in Europe. (They didn’t let me play it.) There are numerous tombs dotted around the place also, as well as many references to our history and colourful relationship history with the British . Our tour guide was at pains to point out that because the building is protected, they weren’t allowed to “get rid” of anything, so the Union Flags and royal seals remain intact. But we’ve moved on, so that’s okay, right? There is a large area in the North Nave dedicated to all our War dead, with laurel and poppy wreaths. I wouldn’t know where to put my fingers first…. There is so much more I could tell you about this place, even after a whistle-stop tour, but this is just a taster. I strongly suggest that if you have time, you pop in and see for yourself, but if you’re curious to learn more, have a look at the Cathedral Tales page here. One thing I did notice on my visit was just how much information is available on the cathedral if you’re thirsty for hard facts. There are QR codes dotted everywhere, leading to video, audio and text content (they even have free wifi). They have an fantastic website, and maintain an active and responsive social media presence on Facebook and Twitter. There’s also more to see – the Marsh Library, Ireland’s oldest public library is on the grounds, but wasn’t open today. It’s a lovely way to pass a couple of hours – go see. That’ll do nicely for a difficult second date – I left wanting more, and feeling just a little bit more knowledgeable, which was the aim of this whole exercise. Until the next day out, thanks for reading! Every Christmas, they show Handel’s Messiah in St Patrick’s Cathedral. If you ever get a chance go see it. 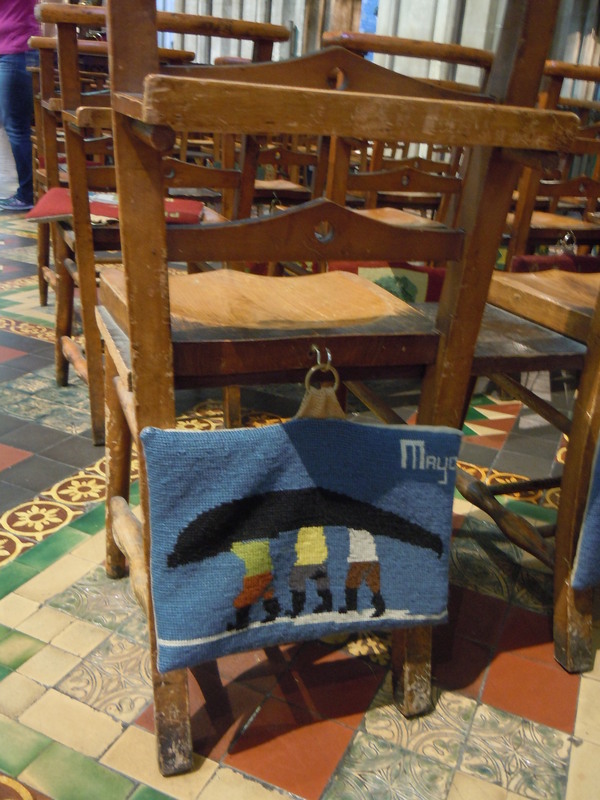 Just bring a cushion as the pews are hard on the auld bum!